Help turn your little girl into a brand new piece of royalty at her next big birthday when you get items from the collection of Sofia the First Party Supplies! Favors like tattoos, personalized magnets, and key chains, decorations like table covers, cupcake picks, and helpful tableware like dinner plates, napkins, and utensils. Sofia the First proves that any ordinary girl can become a princess! When her mother marries the king, Sofia became a princess overnight. Your little girl can do the very same when she has a Sofia the First themed birthday party! Join the fun as you celebrate your very own princess’s birthday with all her friends and the rest of the Disney Princess gang. You’ll find everything you need in one place to create the most fantastic birthday celebration for the most important princess in your life. Bring Sofia the First and all her woodland friends to life for the most magical celebration your daughter has ever experienced. Creating a special birthday party environment is all about the supplies. Go above and beyond with pretty princess goblets and faux pearls strewn about your table setup. This inexpensive tip will have all the little princess guests feeling like true royalty. Planning an extravagant birthday party fit for a princess isn’t easy. The Birthday Express Ideas & Inspiration blog has tips and tricks to help you execute your plan so you can show your daughter how special she truly is. From DIY projects to brilliant ideas, this blog has it all. Teach your daughter some princess manners with these cute and thoughtful thank you cards. This bonus set includes both the invitations and the thank you cards, so you can get all you need at once. 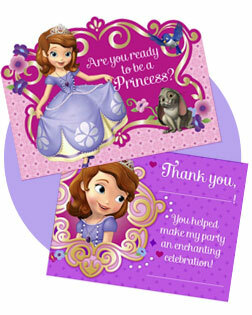 Not only do these fun postcards match your princess theme, but she’ll be able to write them herself! Being a princess is all about color, style and sparkle, so a princess party isn’t complete without tons of beautiful decorations. Don’t forget anything when creating the perfect party for your little princess. She’ll have a smile on her face all day when she sees every decoration strategically placed just for her. From balloon bouquets to wall and table decorations, don’t miss out on anything when setting up your Sofia the First birthday party. What’s a birthday party without balloons? Add some princess magic to your party with a brilliant balloon bouquet. Featuring Sofia the First in her lovely lavender gown and tiara, these balloons will match perfectly with your theme and everyone’s purple and pink outfits. If you’re going to have a princess party, the castle is the most important part. This Wall Burst castle will transform any party venue into an elegant royal kingdom. Watch your daughter and her friends have a blast posing and pretending to be princesses in front of this amazing pink Castle Spire. Princesses deserve more than any old plain tableware. For a party that is up to royal standards, you’ll need to go all out with the sparkly pink and purple motif. With plates, cups, napkins and plastic ware, the little ones will love enjoying their cake and ice cream while pretending they’re really at a royal table. You could have all the decorations in the world, but your party won't be ready until you plan a variety of fun activities. Princesses are all about friendship, fun and kindness, so teach the kids some friendly games! Time flies when you’re having fun, and this party will peacefully float on by with all of these fun activities. Start with a piñata, add in a lively potato sack race game and end the party with a fabulous photo shoot! Bring a noble twist to this classic party game when you incorporate this Disney Junior princess favorite. This kit includes not only the piñata, but fillers, a blindfold and a buster. The only thing left to do is have the kids line up and play the game! Entice the kids at the Sofia the First birthday party with the amazing party game! This pin-the-tail-on-the-donkey-style game will have the have the girls at the party even more excited! Your little princess guests will be so good at the party, they’re sure to deserve a special take-home treat. Give them something to make the memories last even longer with fun party favors to take home to their family and friends. Impress other parents with your party planning abilities and they’ll be talking about your party success for weeks. 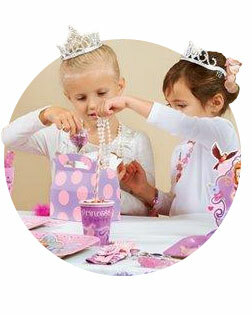 From party favor value packs to favor boxes and buckets, you’ll find the perfect treats to fit with your princess theme. 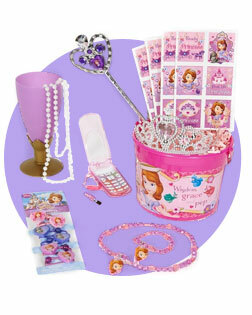 Celebrate Sofia the First style with this princess prize pack. With such a wide variety of treasures, this kit is sure to please the eyes of any tiny princess. Let your guests play dress up with heart bracelets, beaded necklaces and plastic rings. Pack all the princess prizes in one convenient handled bucket! Featuring everything Sofia the First, this bucket has a wand, hair ponies, a necklace and bracelet set, and princess stickers. With these buckets, your guests will leave knowing they can be a princess any and every day of the week.